Pondmaster Magnetic Drive (Mag Drive) 1200gph Pump SHIPS FREE! 1200 gph pump w/18' cord. 110 watts; 1.50 amps. 880 gph @ 3', 800 gph @ 5', 580 gph @ 10'. shut off 13.5'. 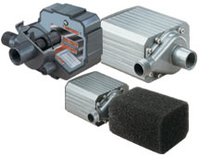 Powerful ceramic magnetic impeller is the only moving part which makes these pumps extremely energy efficient. 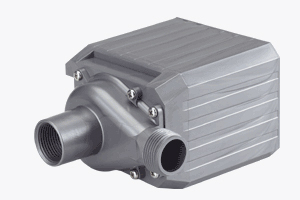 Pumps can be used inline or submerged. 3/4" FNPT intake and 3/4" MNPT discharge. Includes pre filter. Limited 5 year warranty.